Owners of the Samsung Galaxy Nexus have surely heard the name Android Open Kang Project (AOKP). It is undoubtedly one of the most, if not thee most commonly used custom ROM available for select devices. I have had the opportunity to have a quick session with lead developer Roman Birg of AOKP and ask him some questions to get inside the mind of one of today’s top developers. DL: So, Roman. What started your work on the AOKP? DL: What’s your background in development in general? Do you have proper schooling in that or are you all self-taught? It seems like a lot of the Android devs out there these days pumping out ROMs have all just picked up their skills from fellow developers. Roman: I’m a Computer Science major at college (and they teach Java), but I don’t think any college courses helped me with Android, maybe with a little bit of Java coding, but Android is just so much more than that. DL: So what got you into Android development in the first place? Roman: After I got a Samsung Vibrant, I was just flashing everything I could for a couple months. After a while, I wasn’t satisfied with something a ROM developer had done and I wanted to change it to how it was before. it just snow balled from there – I started doing a little theming. Then I started smali hacking and adding new features. DL: So your first Android device was the Vibrant? Roman: Yes and no, I found a G1 for like $90 on eBay a few months prior to getting my Vibrant. I’m pretty sure I didn’t even have the G1 24 hours before rooting and putting CyanogenMod on it. DL: Nice – So do you also work full time alongside development on Android or have you made Android your full time? It seems you put so much work into AOKP that you wouldn’t have time for anything else. Roman: Actually, I’m a full time student at college, and I was working 20 hours a week until about a week ago. DL: What were you doing for work? Anything exciting? Roman: I was working for a network research lab at school. It’s not as exciting as Android. DL: What do you see in the future for your work on Android? Any goals you have set for yourself? Roman: Ideally, I’d love to make ROMs as a job, but unfortunately, that doesn’t pay nearly enough to sustain anyone. However! Very soon, I’ll be starting to develop Android Apps. I could definitely see myself doing that in the future. Hopefully I have some success doing that. DL: So, what types of apps are looking to make? Roman: I’ve actually started working on my first app just yesterday. I’m working closely with the guys at RootzWiki to bring something (hopefully) awesome for all ROM fiends. It’s tentatively named RootzBox. DL: Hmm, RootzBox? Can you give us a little hint as to what the app’s purpose is? Roman: It’s still early in it’s planning and development, but the idea is to make everything related to ROMs easier on the user. We’ve got some nice features planned that will make the app unique and Rootz-worthy . DL: Nice, be sure to keep us posted on that. So what do you think it is that has made AOKP so tremendously popular among users? Did you plan on creating a ROM that would make people even put CyanogenMod in the backseat for a bit? Roman: Honestly, I had no idea it would get as big as it has. I do this all for fun, so I was just doing whatever — adding a feature here and there, whatever I felt like doing at the time. Ever since I started playing with ROMs, I’ve always been about options and user-choice. So after a while, I had a toggle for this and I had a toggle for that. People are able customize their phone and make it feel different than others. Furthermore, the community involvement has just been amazing, which is more than any ROM dev could want. People submit code to add a feature, or maybe improve on a feature that’s already been added. AOKP would be nothing without those who’ve contributed (Zaphod-Beeble, Whitehawkx, sethyx, Khas-Mek, and ProTekk just to name a few). And on the subject of CyanogenMod – I just want to point out that I’m not in any way trying to compete with them. While AOKP is made from pure AOSP, we wouldn’t be able to get AOKP on any phone that’s not supported by AOSP without CyanogenMod and all of the people who contribute to it. DL: So right off the top of your head, what types of features are you hoping to bring to future versions of AOKP? Anything you want to do but don’t have the ability, or means to quite yet? Anything like that on your mind lately? Roman: I would love to be able to add a theme manager (like the T-Mobile one that CM7 had), but I don’t know nearly enough to accomplish something like that. More realistically, I think we’d be able to add a way for the user to change the color scheme of the whole ROM. Right now you can change the color of your clock, signal text, and a few other things, but I’d love to let the user be able to pick a color, and their whole phone be in that color. DL: That’s something everyone has been hoping for. Okay, so I have to ask – What’s the deal with the pink unicorns? Roman: Whitehawkx and I have a T-Mo SGS2 ROM and it has ROM Control kind of like AOKP, but it’s much more limited since we’re smali-hacking all the features in. Anyways, one day we were just joking around and thought it’d be really awesome to make pink unicorn our ‘logo.’ Before we know it, one of our friends, kwes, makes us a unicorn logo and Rascarlo makes us that boot animation. And it just stuck. 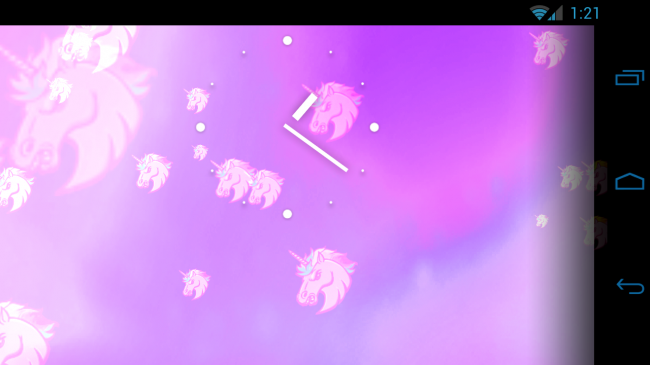 DL: Just last night I went to apply my favorite live wallpaper Phase Beam and noticed it had been replaced by cute pink unicorn heads dancing on my screen. Fabulous! Roman: That was actually a user-contribution! We all loved it when we saw it, there’s no way I couldn’t not include it. It’s definitely fabulous. DL: Awesome. Well to wrap it up, is there anything else you want to say to the community, users, fellow devs or anything? Roman: We’re all here to learn and make our devices better. Users: don’t be afraid to ask questions and be as nice as you can to other users (I remember when I was deathly afraid of posting in fear of being scowled for asking something that was answered 10,000 pages back). Developers: open source is what drives this community, keep it that way. DL: Excellent, thanks for talking with us! Roman: May the kang be with you. If you want to learn more about the AOKP or give it a go on your device, you can find downloads and all the info you will ever need over the AOKP site. Interested in reading other developer interviews we have held? Then you can search through here and find them all.